A one-woman performance of song, poetry, theatre, and spoken word, the One Voice Project is a response to the question: What can one person, one body, one voice, express, through sound, movement, song, theatre, poetry, spoken word, silence? Performed live and unaccompanied, with minimal props, in beautiful and unusual spaces throughout the Midwest, the One Voice Project connects the worlds of music, theatre, and the written word. Featuring six brand-new musical works by composers from the U.S. and abroad, the inaugural tour of the One Voice Project offers audiences a multifaceted artistic experience. Tour Dates & Locations forthcoming. Thank you to everyone who submitted scores to the One Voice Project! Composers will be contacted during the spring and summer of 2015 regarding programming. Winning pieces will be performed during Lisa's 2015-2016 concert season and composers will receive audio and/or video recordings of their work. Look for details about the 2016 One Voice Project call for scores later this year. 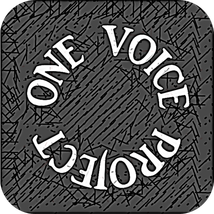 The goal of the One Voice Project is to expand the repertoire for unaccompanied voice. While there is a strong tradition of solo instrumental works in the classical repertoire, there are relatively few works for solo voice and classical singers rarely perform as true soloists. By partnering with living composers, the One Voice Project will promote unaccompanied vocal performance as a genre and promote the creation of new works for singers. Texts: Composer must obtain permission to use texts that are not within common domain. A translation (preferably word-for-word) should be supplied for non-English works. If the text is not in a standard singing language (English, French, German, or Italian), please supply IPA (International Phonetic Alphabet). Range: Suitable for lyric mezzo voice, but need not be written exclusively for mezzo-soprano. 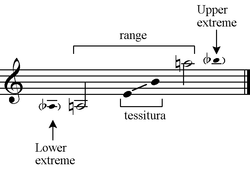 Below is a guide to range & tessitura considerations for the lyric mezzo-soprano voice. Upper and lower register extremes should be written for sparingly and with care. Include your full name, email address, and short professional bio in your email. Results will be announced via email and online at www.lisanehermusic.com no later than February 15, 2015. Multiple winners may be chosen. Winning composition(s) will receive one or more performances as part of Lisa Neher’s 2015-2016 concert season and an audio and/or video recording of the performance.